The real goal of the Muslim – it says it in the Quran. The real goal of the Muslim is to see the Face of Allah. This is what we want. I want that. That is so important to us – to be close to the One that created you. That is who we love, more than anything or anybody. And for the people with that tabloid mentality that like to look at pictures of naked women and stuff, that’s their hangup. That’s not our hangup. Don’t put their trip on us. We want to be with Allah. Source: His lecture entitled, “Till Kingdom Come” (at precisely 1:48:38) on Safeshare / Youtube. …There would not be physical relations as we know them here. The evil thoughts and lust are not a part of the Paradise. Only pure and good things are there. For those people whose minds are engrossed in the filth and folly of this life, naturally they will try to compare what we know about the Jennah to their own sick, dirty and unfulfilled world. When they try to compare what they know to what Allah has in store for the people of Paradise, they will never comprehend even the smallest beauty there. Leave these people and their thinking and come to the correct thinking of the true believers in Allah. 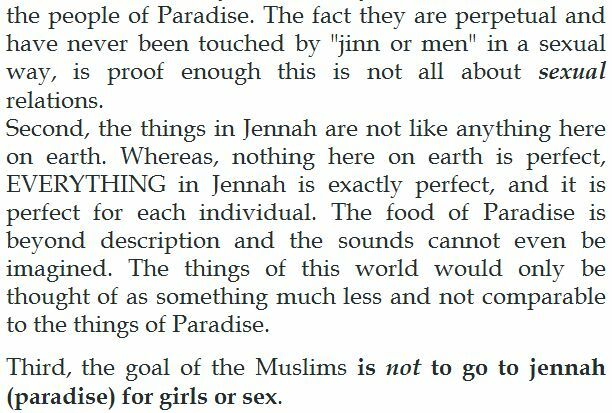 Here is Yusuf Estes, once again, mocking the divine Wisdom of Allah from a new angle and unjustly slandering the upright Muslims who are motivated by the Quranic descriptions of the joys of Paradise. Allah Himself has described these pure virgin maidens of Paradise, to encourage Muslim men to be pious and earn His Favor and Mercy. This means that a person who becomes excited about their descriptions and motivated to work for Paradise is a person responding to the divine invitation of Allah directly. Thus, he is a true Muslim, and he is praiseworthy in every sense of the word. Allah’s invitation is based on His divine Wisdom, and thus it is a pure and wholesome invitation, not tainted or lowly in any way. It is not a call to motivate corrupt people with a “tabloid mentality” who “like to look at pictures of naked women,” as Yusuf Estes has so falsely and shamefully assumed. Allah calls the people to Paradise in a way that motivates their very souls to long for what He describes in Paradise. The Prophet (may Allah raise his rank and grant him peace) and the Companions were the first people to be motivated by these Quranic invitations, and they were certainly not the kind of corrupt people whom Yusuf Estes has described. They were the best of people, the most refined and purest of souls. Quite simply, to find fault with people who respond to the call of Allah is to find fault with Allah Himself and His divine Wisdom, as if to say: It was not appropriate for Allah to encourage people in this manner…! Allah’s Refuge is sought from such disbelief. These words of Yusuf Estes are certainly not surprising, for those who have been following the clarifications of his ill teachings here on this website. He has been speaking with horrible violations of basic Muslim beliefs worse than this for over ten years, completely unchecked by his fellow TV co-stars like Bilal Philips, Abu Usaamah, Assim al-Hakeem, etc. We ask Allah to guide all of them away from their false alliances of destructive partisanship that silence them in the face of these many atrocities being committed in the name of Islamic da’wah. Allah is the One who hears and responds to our prayers. I thought he was talking about non-Mulsims who make it an issue. Can you contact him and ask him what was his intention? Assalamu alaikum& Jazakallah khair. I have been muslim for six years and started with many lies, such as from yusuf estes and others. Most things My husband I were taught are… Lies. It makes me sad and embarrassed I ever paid attention to these liars. I used to defend them out of ignorance. I feel as though I don’t know how to fix it. Or where to start. I have, in the meantime confined myself to the home to memorize Quran with my sons and nothing else. The most humiliating thing was when you wrote “it’s not character assassination…” Because that is exactly what I accused someone when they spoke of yusuf estes badly in front of me 2 years ago. May Allah guide us all, ameen.